First Aid Checklist for Kids. An emergency at home can make you run around the house looking for a first aid box. And, to make things worse, you don't find what you want in it! We have all gone through this experience at some point. To avoid such situations, here is a checklist for you to make sure your first aid box has everything you need! It is unlikely to find everything you need in a single readily assembled first aid kit. So, you could buy a prepackaged first aid kit and slowly add on things you require. • Infant or Child thermometer: Depending on your child's age you can buy a rectal or a digital underarm thermometer. • Pain reliever for infants and children: Avoid aspirin. Paracetamol in the liquid or tablet form is suggested. Check with your doctor for the right dosage to be administered as it varies according to age and weight. Make it a habit to check expiry dates of all medicines regularly. • Cough syrup or decongestant recommended by your doctor. • Sting reliever spray for insect bites. • Calamine lotion for skin rashes and sun burn. • Antibacterial cream for bruises, scrapes and cuts. • Medicated creams for diaper and nappy rashes. • Tweezers and needles for thorns and splinters. Also include matches and alcohols to sterilize them. • A pair of sharp scissors. • Children's insect repellent and sun screen lotion. • ORS sachets if advised by your doctor in case of dehydration or diarrhea. • Assorted bandages to hold dressing in place. Some kid's bandages come with cartoon prints on it, which might be helpful to calm down your baby. • Adhesive tape, finger bandage, sterilized gauze, cotton wool and few cotton buds. • Mild liquid baby soap and wet wipes. • Include a calibrated cup to administer syrups for infants and children. • Keep yourself updated with a first aid manual. 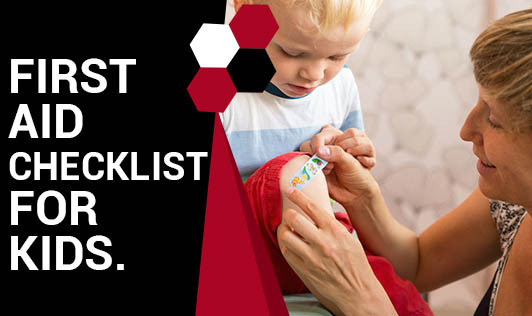 • In case your child has asthma, allergy to bee stings, peanuts or shell fish or any other kind of allergy, make sure you carry his medication, and also carry a spare set in your first aid kit. • Emergency names and contact numbers: Most important in a family's first aid kit! It must contain the names and contact numbers of your family doctor, local hospital, emergency helpline, ambulance, and a close relative. So, now you have a list, make your kid's first aid box fully equipped!